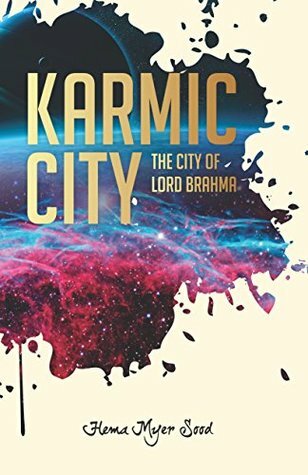 Karmic City: The City of Lord Brahma by Hema Myer Sood is a first book in the trilogy. The plot of the book based on Indian philosophy. The cover page looks good, and the title is striking. In this book, Hema Sood has portrayed a spiritual and subtle relationship between man and the soul. This book gives an insight into how one can achieve high knowledge through meditation and constant prayers. It's good to read about the soul's journey and cultivating positive thoughts. I really like the poetry part and the story of Karma which influence one's birthplace and parents. It proves to be a refreshing and deep-seated read. The main character in Karmic City has been depicted as an ageless and nameless entity called the Soul. The Soul enlightens the path of spiritual knowledge to four individuals named Aditi, Vaidehi, Virat, and Karthik. According to the author, one can easily absorb the knowledge from personal experiences rather than a slight performance of scriptural awareness. If those experiences are favorable we term them as good, and the unfavorable experience we relate to as bad. Our internal dialogues rule our lives, and external thoughts manifest from the ego. This book helps you to nurture positive thoughts and assist you to live a healthy spiritual lifestyle. The narration is smooth. The author's lexicon is majestic. I can't find a single flaw in her writing. I really admire Hema's work and writing style. One should definitely read this reflective piece. I recommend this book to everyone but if you are into spiritual stuff then must read this book. "Life is a combination of an unending series of different waves."